We are focused on helping you deliver a unique experience in any aspect of your business model! sales tool (appreciation, warm leads, follow up. We work to develop the perfect program to meet your vision, objectives and budget. We personalize, it is not a cookie cutter approach to the gift experience! Our specialty is working with businesses and organizations to find customized solution and then deliver excellence in customer service. Cookie gifts are memorable! People love receiving something that they can share with others or take a break in their office with a cup of coffee. one or two cookies in a bag or box with a message. 3 cookies in a bag with a message. 4, 6, 8, 10, 12, 14, 16, 24, 36, 48 cookies in a gift box! 12, 14, 24, 32, 36 cookies in a tin! We have a wonderful portfolio of gifts and ideas for the individual business gift or if you want to send cookies to the office. We package them to meet your needs. Let us know what your goal is and we will offer you 3 ideas to consider. Simply order your sample and we will send you our corporate sample box. We will send you 8 cookies in our box with sample of our belly band, our catalog and other information. We ask that you pay for shipping, which will be reimbursed on your first order! We will only ship to business addresses. Blue Chip Cookies reserves the right to refuse samples to anyone at our discretion. As part of our sample policy, you will receive our emails, which you can unsubscribe from at any time. 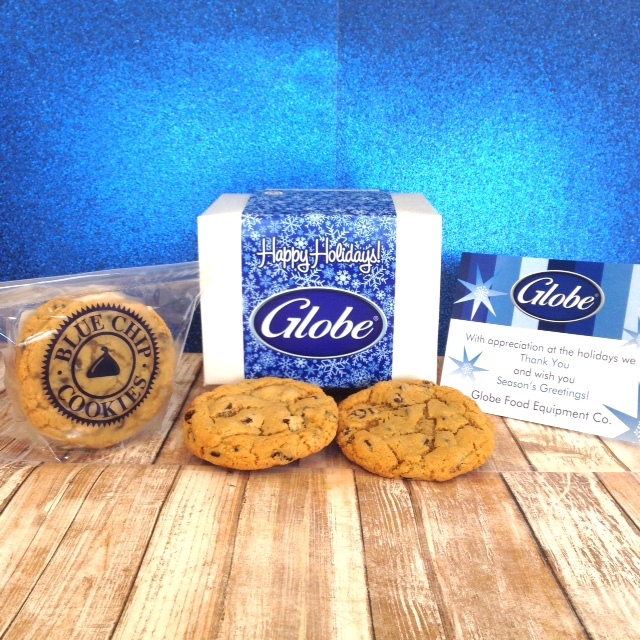 Blue Chip Cookies will provide 1 free sample to our registered, qualified business customers. Almond Toffee: A unique blend of almonds, toffee brickle and semi-sweet chocolate chip. Blue Chip Joy: Just like a candy bar, Almonds, Semi-Sweet Chocolate Chip, and Coconut. Blue Chip Royale: Almonds, White Chocolate and Toffee! A Cookie made for Royalty! Chocolate Chip: The classic cookie made with semi-sweet chips and then combined with Blue Chip Cookies’ secret ingredients. Yummy to the last bite. Voted Best Cookie in over 10 cities. Chocolate Chip M&M: A Colorful Chocolate Chip Cookies combined with the favorite M&M candy. Chocolate Chip Macadamia: Take the classic chocolate chip cookie and add Hawaiian Macadamia Nuts to it...aloha! Chocolate Chip Walnut: Chocolate Chip with walnuts. Cinnamon Delight (Snickerdoodle): Exactly how it sounds! A cookie that’s light and airy with cinnamon. A favorite for many! Oatmeal Raisin: A favorite of many of our customers, our oatmeal raisin is made with raisins, oats and macaroon coconut. Peanut Butter: Just an old-fashioned delicious peanut butter cookie. Creamy, not crunchy. Peanut Butter Surprise: Milk Chocolate in a Peanut Butter Cookie! Sounds like a commercial. Sugar: Just plain and simple...with a little light sugar on the top. Sugar with Seasonal Sprinkles, just the perfect cookies for any day! Triple Chocolate: Oban, Semi-Sweet, and Milk Chocolate combined for the ultimate chocolate cookie. White Chocolate Chip: It is exactly what it sounds like…instead of chocolate chips there are white chocolate chips. Scrumptious! Trail Mix: Looking to have a Gluten Free option in your assortment for someone, add our delicious Gourmet Trail Mix...all the delicious ingredients without the yummy dough, .3 lbs. Rotating Flavors (All flavors can be ordered by the box under "Single Flavors Category): Availability will be limited during Holiday Season. Cranberry & Cream: Dried cranberries and white chocolate. Lemon Meringue: White chocolate folded into our lemon cookie, taste like a lemon meringue pie. Chip Chip Hurray: Our newest cookie sensation of chocolate chip cookie with Ressees Peanut Butter chips and bits. Gluten Free Brownies and Bars, plus Gluten Free Trail Mix. From Tricia F. of Hemet, California on 9/12/2017 .